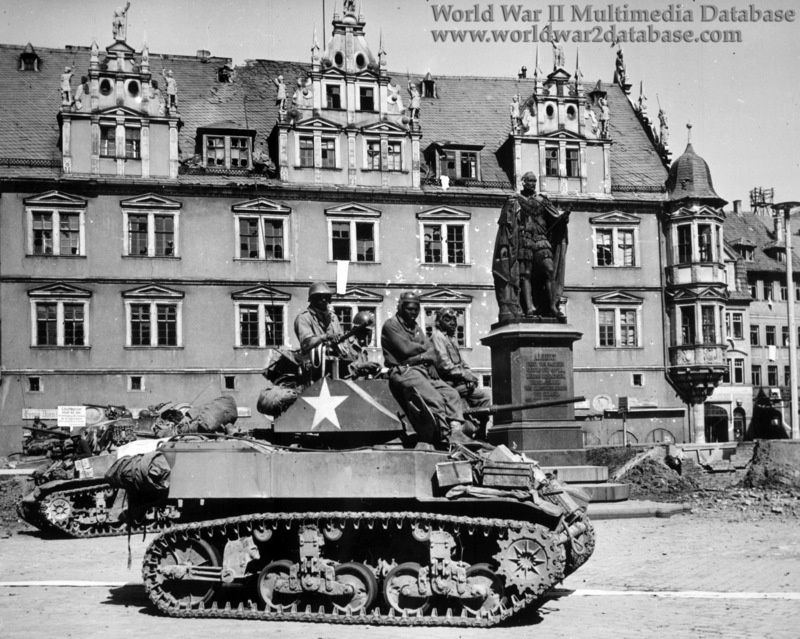 On April 11, the segregated 761st Tank Battalion, attached to the 71st Infantry Division, Third Army, 12th Army Group, captured the town of Colburg, fifty miles from the Czechoslovakian border. Stiff resistance consisting of machine guns, panzerfaust anti-tank weapons, mortars, and even a few German planes, made the encirclement of Coburg an all-day battle. The 761st, 71st, and Combat Command B of the 11th Armored Division received the surrender of the city's mayor. In this view, an M5A1 Stuart light tank of Dog Company of the 761st moves through the town square to clear out snipers. Note the damage to the windows of the upper floor as they machine gunned the windows to kill any Germans hiding there. M4 Sherman tanks are in the background. After this action the 761st enjoyed their first fresh food and beds for weeks, liberating chicken, cognac, and feather beds from the townfolk.